Welcome to a new development at EETH: A multi-movie review! I sort of teased this concept way back when I reviewed Andrew Lau’s Infernal Affairs (2002) and essentially provided a ghost review of Martin Scorsese’s The Departed (2006, how could I not?). I figured it was time to go the whole nine yards and review certain films together for which it would be repetitive to write full reviews individually. This is similar to yet different than My Take on the Transformers franchise (2007, 2009, 2011, 2014) and the Fast and the Furious franchise (2001-2015), in that this is less a rant and, well, an attempt at actual objective analysis. Today we cover John Carpenter’s much misunderstood and overlooked “Apocalypse Trilogy,” a trio of horror films with relatively bleak endings whose stories all have something to do with end of the world, or the threat of such. While each scary movie dabbles in other genres to a certain extent (for instance, The Thing is sci-fi horror while Prince of Darkness is a more straightforward demonic possession affair), all are thematically similar and carry Carpenter’s distinct penchant for body-horror and gory monster thrills. Characteristic of most of Carpenter’s filmography, all three were critically maligned upon release and only one, Prince of Darkness, was a commercial success. Say goodbye to classical reality, because our logic collapses on the subatomic level into ghosts and shadows… While order does exist in the universe, it is not at all what we had in mind. It’d be an accurate statement to say that Carpenter is one of the most unfairly treated and underappreciated filmmakers who ever worked in the medium. He’s as competent in sci-fi horror and gore effects as David Cronenberg and works in as many genres as Ridley Scott, but few have recognized him as such until recent years. Most of his films were financial or critical failures, the most notable exceptions being Halloween (1978) and Escape from New York (1981). However, most of his films from the 70s and 80s have gained strong cult followings and many are now recognized as genre masterpieces. It’s not such a brash statement, really, as films like Scott’s Alien (1979) and Blade Runner (1982) weren’t appreciated until decades later. Movies like Big Trouble in Little China (1986) and They Live (1988) are hilarious riffs on Asian-American culture and the Reagan Era, respectively, and have contributed much to Carpenter’s deserved career vindication. His Apocalypse Trilogy remains one of his last divisive works. I have no doubt all three films will be fully appreciated years from now (as of this writing, only The Thing is widely respected critically), but for my part I have no intention on waiting for it to be cool to like certain movies. I applaud films that are good, period. Perhaps the first misunderstood Carpenter film to be retroactively praised, this remake was one of the earliest and most notable re-adaptations of a literary source material to be more faithful to the book than its predecessor, Howard Hawks’ and Christian Nyby’s The Thing from Another World (1951). Like Joseph W. Campbell’s Who Goes There? (1938), Carpenter’s film follows an American research team in Antarctica who are hunted by a parasitic shape-shifting alien that infiltrates their research station. Suppose what your faith has said is essentially correct. Suppose there is a universal mind controlling everything, a god willing the behavior of every subatomic particle. Well, every particle has an anti-particle, its mirror image, its negative side. Maybe this universal mind resides in the mirror image instead of in our universe as we wanted to believe. Maybe he’s anti-god, bringing darkness instead of light. As spooky and grim as The Thing was, Carpenter would turn up the creep factor even higher for the unofficial trilogy’s next installment. Prince of Darkness (PoD) is perhaps the most unsettling of any Carpenter flick (including Halloween), despite the fact that its ending is one of his more ambiguous. It also boasts one of his campiest yet most irresistible premises: The body of the anti-Christ has been locked away for millennia in a giant metal canister, hidden in the crypts of a Los Angeles Catholic church. A priest and a group of scientists investigate the canister before all hell quite literally breaks loose in the building, and our heroes must find a way to stop the anti-Christ from summoning his father, Satan himself, from the realm of anti-matter. PoD is essentially a super-nerdy take on demonic, Judeo-Christian mythology combined with sci-fi tinges of quantum mechanics and particle physics. Much of the science becomes hackneyed and convoluted by the story’s end, but the film’s unending dedication to a pseudo-scientific, physical explanation for the devil’s existence and a source of pure evil is admirable. Much of PoD’s dark charm stems from Carpenter’s great music (a regular asset in his filmography, if you haven’t noticed) and the narrative’s incredible patience. Over an hour of the film’s 101-minute running time is dedicated to establishing the antagonists’ history and origin, as well as slowly eliminating several red-shirts until the remaining survivors finally realize the jig is up. This tactic works surprisingly well given the effective scares in the movie’s final half hour and how well the story is paced. Many of the special effects are limited by the film’s chump budget, but Carpenter films them with restraint and manages to paint some hauntingly beautiful visuals nonetheless, such as the swirling canister of titular evil and teasing shots of Satan’s anti-matter universe. On the surface, Carpenter’s final installment in his thematic trilogy seems the wackiest and least serious, almost a sort of black horror comedy, if you will. Delving beneath the surface, however, reveals some of Carpenter’s most alarming existential analyses, as well as a true penchant for Lovecraftian horror, and in the end the film delivers the long awaited apocalypse the previous two films threatened. A great essay by Orrin Grey describes how the entire Apocalypse Trilogy is in some way influenced by the works of H.P. Lovecraft, the master of what is known as “cosmic horror,” a subgenre of literary fiction in which narrative scares are generated not necessarily from external predators or gory deaths, but rather the horror of the unknown or the unknowable. All three of these films embody this Lovecraftian theme to some extent, a horrifying, threatening reality beyond humanity’s comprehension or control, but In the Mouth of Madness (IMM) is one of the most overt and dedicated Lovecraftian films ever made. The premise of IMM is that a famous author has written a series of immensely popular horror novels, which cause many “less mentally stable” readers to go crazy. 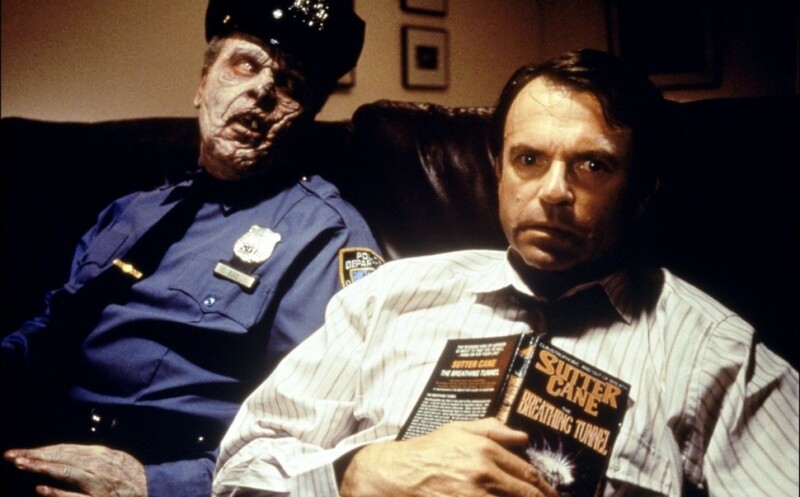 Once the author, a man by the name of Sutter Cane, goes missing, the publishers behind his novels send an insurance investigator, played by Sam Neill, to track him down. Neill soon finds himself living portions of his life as described by Cane’s work, and eventually the walls of reality and fantasy come crashing down all around him. IMM’s greatest strength, its approach to surrealist horror and ambiguous narrative reality, is also its greatest weakness. As each film in Carpenter’s trilogy expands the scope and scale of each respective apocalyptic threat, the subsequent contradictions in logic become more frequent and the audience is asked to further raise their suspension of disbelief. I stated earlier that this doesn’t come close to ruining the well crafted cosmic horror of PoD, and it doesn’t here in IMM, but since the running theme of the latter is that there may be no objective reality at all, the film’s erratic portrayal of character point-of-view, dream sequences, and narrative progression may prove frustrating or unrewarding for some. Regardless whether one views these films as a cohesive trilogy, views them “out of order,” or appreciates them as as standalone movies in their own right, it’s important to recognize them as prime examples of John Carpenter’s heavily mistreated, misunderstood, yet slowly vindicated legacy. Only recently have modern filmmakers and fans begun to regard him as influential artist, and that his artistic success extends far beyond Halloween. It’s the end of the world, and I feel fine. Speaking of that holiday, if you’re looking for some old-school scares this October 31st, I can’t recommend a trio of spooky films more highly than the Apocalypse Trilogy. They all feature admirable dedication to Lovecraft’s ideal of a cold, uncaring universe in which humanity is of little importance, an ideal that is far more unsettling than a generic boogeyman. Thematically, it is perhaps the opposite of films like The Babadook (2014), a Jekyll and Hyde story where the ultimate horror lies within oneself; in Carpenter’s world, while real boogeymen may exist, their true horror is how they represent a world that does not care about us, our identity, or our free will. In fact, as this trilogy asserts, we may not have much identity or free will at all. And our reality may be far from what we think it is. OVERALL TRILOGY SUMMARY & RECOMMENDATION: Stylistically diverse while thematically consistent, John Carpenter’s Apocalypse Trilogy demonstrates the horror of the end of the world far better than most post-apocalyptic scenarios or zombie-fiction could ever hope. — However… acting and logic-wise, The Thing, Prince of Darkness, and In the Mouth of Madness aren’t the best. Aspects of each movie’s style haven’t aged well.
? I just remembered I can’t wait for Halloween! I’ve never seen any of these and I guess now I don’t have to! THE THING………………..ONE OF THE GREATS!